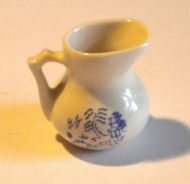 A Bedroom Jug in Blue Willow Pattern. 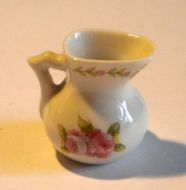 A Floral Bedroom Jug, ideal in any Victorian Bedroom or Bathroom. Fine white Marbled Opaque Bowl, with a gilded lip. This can be used as a fruit bowl, or just as a decorative item. Fine Green Marvled Ceramic Bowl, with gilded lip. 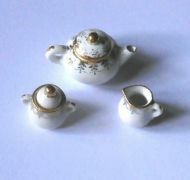 Can be used as a beautiful fruit bowl, or as a decorative item. A Ceramic Cheese Dish, decorated with a rose pattern. A Pink China Tureen with lid, made by Avon China. 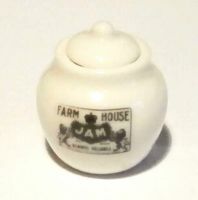 A Ceramic Cookie Jar with Lid. A china mug decorated with a small blue flower motif.